If you have deep pockets and would like to take battling robots game to the next level, you might be interested in these fantastic Bionic Bopper Cars. Which allow you and a friend or enemy to battle it out using the robots to take the brunt of the punches. The motorised robots allow you to stand within a protective cage and try to land punches on your opponent. Every time to land a blow to the chin your score a point and the robots head flips back. Similar to bumper cars, a driver up to 300 lbs can use them and they are powered by Honda gas engines which allows the robots to travel at 3 mph. 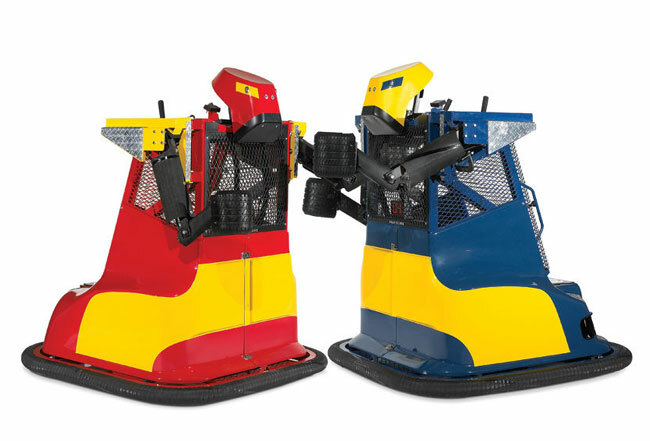 Within the protective steel cage cockpit there are thumb-triggered buttons on two independent joysticks to activate two pneumatic-powered, tire-tread-fisted arms to land punches. Power to the vehicles can provide 5hrs of no stop action via built-in rechargeable 12-volt batteries. The Bionic Bopper Cars are available to purchase for $17,000 each and are suitable for ages 8 and up.